After reaching its target, Eurodollar started fast descending movement; stop on my sell order is already in the black. In the future, after completing local correction pair is expected to continue falling down towards closest group of fibo-levels. Possibly, correction continues at H1 chart; target is at local level of 38.2%. If later price rebounds from it, pair may start new descending movement. Franc rebounded from lower fibo-levels and started fast ascending movement. Possibly, price may correct for a while in the nearest future, but later it is expected to continue growing up towards upper fibo-levels. At H1 chart, price is forming short-term flat pattern; target of this correction is 38.2%, from which it may later rebound. 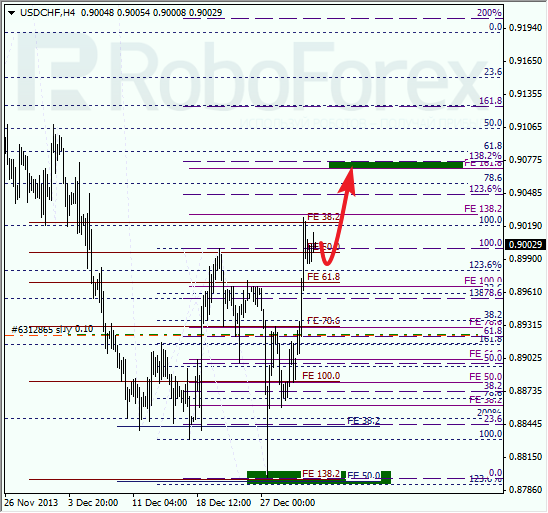 According to analysis of temporary fibo-zones, upper levels may be reached in the beginning of the next week.